The Ace 150 and Ace 250 models have been Garrett’s most popular entry-level metal detectors on the market, particularly because of their very similar range of features that make them ideal for simple tasks such as coin shooting. With the Ace 150 priced only in the mid to upper $100s and the Ace 250 priced in the low to mid $200s, both metal detectors are affordable and extremely easy to operate, providing beginners with an interesting and very lucrative experience from the very first moments. Both the Garrett Ace 150 and Ace 250 are extremely easy to operate for beginner and intermediary detectorists, and they are powered by four AA batteries that are included in the package. As for their performance, there are a couple of notable differences between these two machines. While the Ace 150 features only 5 Target ID segments, its newest counterpart, the Ace 250, has 12 segments instead, which makes it more suitable for those individuals who want a more challenging experience. However, beginners will find the 5 segments of the Garrett Ace 150 metal detector quite satisfactory, since they will be able to successfully locate specific items, ranging from nickels to ring pulls. Although both machines have Search Modes, the Ace 250 features two more as compared to the Ace150, plus pinpointing, which can make specific tasks, such as coin shooting, much simpler. Unfortunately, the Garrett Ace 250 does not have Accept/Reject Discrimination to modify discrimination patterns (or search modes), which can be a big inconvenient for more advanced detectorists. Furthermore, the Ace 150 has only 4 levels of sensitivity/depth adjustments, as compared to Ace 250’s 8 levels, which are ideal if you want to make your metal detector more responsive to specific types of metals. Users will also find only one segment of iron discrimination in the Garrett Ace 150, which is quite similar to the Ace 250’s two segments. Besides these differences, both machines have a frequency of 6.5Hz, 3 audio tone ID levels for easier target identification, an adjustable PROformance search coil of 6.5 x 9 inches, both weighing 2.7 pounds. 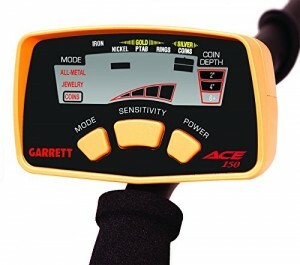 Much to detectorists’ delight, the Garrett Ace 150 and Ace 250 are equipped with an arm cuff that will enhance comfort while detecting; a large LCD screen where the sensitivity, search modes, depth, target ID segments and other similar features are displayed; and a quarter-inch headphone jack that can be used with Garrett’s headphones. When it comes to the Garrett Ace 150, there are several aspects you should be aware of. One customer has reported that the discrimination feature of this metal detector is very poor, which can lead you to dig up plenty of ring pulls and trashy items instead of nickels, dimes or quarters. You need to be extremely realistic in regarding its overall performance: since it is an entry-level machine, it is not that ideal for coin shooting due to the lack of pinpointing search mode and very few target ID segments, sensitivity and iron discrimination. It will help you find several types of metals, but you will end up disappointed many times, and its accuracy will not be as good as expected. The Ace 250 performs a little better since it has a few more features than its older counterpart, but its accuracy will not be significantly better either. There is no ground balance feature that comes with this machine, which can alter its operability, increasing sensitivity and transmitting false signals that will lead you to dig up for gold, silver or other items, only to find nothing. To wrap up the above, both the Garrett Ace 150 and Ace 250 are two excellent metal detectors that will give beginners and hobbyists an enjoyable experience. With a couple of notable differences, these machines perform quite well in most situations, although there are obviously other entry-level models out there with a better performance and more features. Considering that you will be paying between $180 and $250, you should be happy with the features you will get, which will be enough to decide whether metal detecting is suitable for you or not. Both the Garrett Ace 150 and Ace 250 have been very positively responded to by most beginners and hobbyists. One customer has reported she has located an 1893 barber dime in a very good condition using her Ace 150, which was later followed by several other quarters and dimes. Most buyers were very happy with Ace 150’s ability to find several types of metals, including silver and copper, and one detectorist has said he managed to successfully dig up a couple of alloy coins on the beach. Apparently, the only drawback of this machine was its sensitivity to aluminum, which will result in frequent audio tones caused by its presence in the ground. Can be purchased online for around $150. As for the Ace 250, most customers have named it reliable and dependable due to its many Target ID segments, search modes and accept/reject discrimination. One buyer has reported she was very pleased with the readability of the LCD screen, which enabled her to immediately locate nickels and quarters on the beach. Another customer reported that the adjustable length of the Ace 250 makes it an ideal machine for detectorists of all heights, including children. A couple of individuals were not that happy with the noisy sounds of this metal detector, which can make your experience less than optimal. Can be purchased online for around $215. Good day! This device in my first one. In Russia, this device is one of the most popular among fans of the coin search. I have it for 5 months and no complaints there. Unpretentious, tough as a tractor, and most importantly, it looks and very solid! I recommend to begin with! If you are a beginner and you have the money The Garrett Ace 250 is one of the best and easiest machines to use. I myself am still a beginner and I love it. The Ace 250 is simple to operate. The only problem that I have is they are not made for the taller crowd, I had to make an extension bar to make it a bit longer. Other than that it is highly recommended. The Garrett Ace 250 is one awesome little machine! Whether you prefer to hunt in ‘All Metal’, ‘Coin’, ‘Jewelry’, ‘Relic’ or your own ‘Custom Program’, you’ll find the goodies in the ground! You can customize the sensitivity, discrimination, eliminate a find so you don’t dig it up again, and use the pinpoint button to center in on the treasure the meter tells you in the ground before you dig it up. Battery life is nothing short of amazing and last well beyond 20+ hours using 4 AA’s & headphones. The weight of the Ace 250 makes it easy to swing, which keeps you in the game for hours. And last but not least, the meter is very accurate. It’s been my experience that whatever the meter tells you you’ve detected, that’s usually what’s in the ground and the depth gauge is generally dead on. Believe me I researched everything out there before purchasing the Garrett Ace 250 and, as far as I’m concerned, there’s nothing out there that’s any better for the price of the Garrett with Graphic Target ID. Do yourself a favor. Buy the Ace. You’ll be glad you did. I purchased the Garrett ACE 250 after a year and a half of research. I could not have made a better choice. For those, like myself, who are new to Metal Detecting, an “Out of the Box” machine seems like a dream. With the Garrett ACE 250, it’s a reality. The folks at Garrett have an easy to use, lightweight, accurate and well constructed machine in the ACE 250. The digital instrumentation is easy to read and understand. The information is accurate (with practice)and the depth perception right on target. During my research period, I read numerous complaints about the pin-pointing ability of the ACE 250. Learning where the “Sweet Spot” was on the coil was easy and once learned, it was very easy to pin-point targets. In the first 10 hours, I have been able to learn to pinpoint items and even distinguish between trash and treasure. The pull tabs are decreasing and the coins are coming! Kudos to Garrett and I highly recommend this machine to anyone who is considering getting started in this wonderful hobby of Metal Detecting. The Ace 250 is the best metal detector I have ever used. The depth indicator is uncanny in it’s accuracy and the target identification as well. Definitely would recommend this detector. The Ace 250 is the best deal going. For the price, you just can’t beat it. It has an easy learning curve. Be sure to get headphones with adjustable volume controls as the ding sound is pretty loud and it’s nice to be able to turn the volume down some. It’s also a great back up machine if you own a more expensive model and it stops working. It’s also a great loaner when you take someone with you that does not have a detector. I know everyone says, the more expensive the whatever is, the better it must be. Not so with the Ace 250. This little detector is truly a man of detectors. It is super lite, and at the same time super rugged. I can swing this machine all day long. It works well in any condition, and with the sniper coil added, nothing compares to locating good targets in the jungle of trash. Great graphics, great options, with 5 descrim settings, and the wonderful little bell tone when it sniffs out the good stuff. Truly a great machine for the money. I would recommend this machine to anyone getting started, as it is a true turn on and go machine. but I would also tell anyone who is vet at the hobby, put this one in your arsenal. Don’t be fool by the “low price”, this is a serious metal detector with plenty of options to send you home at the end of the day with some quality finds in you pouch. I bought the Ace 250 a few months ago when I was first getting into the hobby. It had no learning curve what so ever. It was turn on and go, and I was finding stuff right off the bat. I will be upgrading to a higher end detector now that I will be sticking with the hobby. But I would recommend the Ace 250 to anyone just starting out in this hobby. I have had the Garrette Ace 250 for only 2 days and have already found an antique 14k gold ring with pearl and 2 diamonds and a 1943 lady liberty dime in perfect condition! This machine Rocks!! I recommend it to anyone who is new at metal detecting. The Ace 250! I really like this machine because its ease of use and it’s similarity to the GTI units. It doesn’t have all the options like volume control or as many settings as the GTI but it seems to work very well on the settings it does have, and it has a very distinctive ping when you’ve located something. This unit also seems to be very accurate on depth and target ID. I recommend this unit to the new hobby goer because of the low initial investment and the total ease of getting started. The instructional DVD that came with it is very helpful and makes this detector a piece of cake to use. It also came with multiple extras like a rain cover, gear bag, an extra coil and a pocket manual to carry with you. I give this one a thumbs up! I bought My Garrett Ace 250 almost a year and a half ago. I read the manual and watched the included DVD.I still review the DVD to make sure I’m not picking up bad or in correct habits.I watched Internet videos which helped give me guidance on how to use it. Recently I spent 30 minutes in my yard.I had 6 hits and everyone turned up something.Mostly old nails.Getting a signal and finding an object helps to build confidence.It also teaches you how to set up the discrimination feature to ignore trash finds such as nails and bottle caps.Most people can learn the Ace 250 in 5 to 10 hours of use or one good weekend.I’d say 20 to 30 hours for it to feel like it’s second nature. 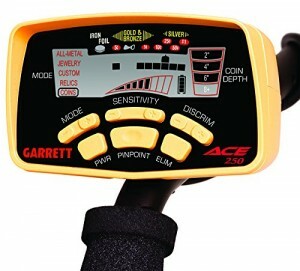 For the money the Ace 250 can’t be beat.If this is your first detector and you’re unsure what you’ll need,buy the combo.It comes with ear phones,digger,storage bag,and more.If you’re experienced or already have an understanding of metal detecting,just purchase the Ace 250 by it’s self.Then you can build your tool list to suit your needs. Either way,join a few good metal detecting websites and forums.The more people that’s on the site the more chances you have to learn insider secrets.Also,they have contests and give away some great products including new metal detectors.So,what are you waiting for?Get the detector that fits the type of detecting and get outside. I am disabled. I can not hardly walk. I had 4 strokes, heart bypass surgery. My wife bought me the Garrett ace 250. It amazed me how it performed. When I first took it out, I turned it on and it was not doing nothing. I was was moving it around my wife has a small wood table she works on and the ace went off. At first I was wondering this is not working right. I went to looking and the table had one metal screw in it. Also in my condition I can carry it because it is so lite. This detector was a god send to me. I find something new every time I use it. Mr. Garrett you named it right because it is an ACE. It is so easy to use. This machine will never cease to amaze me. And the price is almost as stunning as the machine. For the money (around $250 US) I think this detector beats most of them hands down. The feature I like the most is “pinpoint” using this button and the pretty accurate depth meter you will be right on top of your target guaranteed. Another feature I enjoy is the ability to swap out different coils such as the sniper coil for trashy areas and the bigger coil for large areas. I love this detector and I think it would be hard for me to give it up for another. I think the Garrett Ace 250 is an amazing detector! It is ultra light at 2.7 pounds! It also has 5 modes! All metal, custom, relics, Coins, and jewelry! It also shows Deepness up to 8+ inches! I think this detector would work for beginners like my self and also veterans! It is at a great buying price of $212.00! I also like that the Ace 250 has Pinpointing action! I also like that the Ace 250 is easy to understand. This is my Review on The Garrett Ace 250. Don’t dwell on thinking if you should buy it! Buy it because it is worth the money! Thanks for reading my Review and hope you purchase this fine detector! The Ace 250 was my first machine and I used it for about a year. I used it primarily for coin shooting and it did a great job. It has decent depth, an ID screen and different tones. I eventually got to where I did not use the screen and dug entirely on the tones. For some folks starting with it setting the sensitivity down to 3-4 may be a problem, but this is where it seems to work the best. The larger coil will give it a little more depth, but also tends to balance it a little heavy forward, the stock coil balances well. It is sturdy made and very easy on batteries. If using headphones it is loud, so volume control on the phones would be a benefit. I would highly recommend this machine. I’m a guy that loves things that just work. 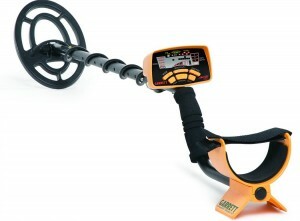 The ACE250 not only works – I would call it the iPod of the metal detecting world. I can’t imagine a greater tool that (for the price) finds as much, is easy to handle and just looks so darn good. In the past month I’ve thrown my 250 at nearly every type of terrain that I can imagine from sandy beaches to clay dirt, to gravel playgrounds and everywhere in-between. I’m always impressed by the ACE250’s reach and accuracy as I’m consistently hitting targets that when dug are right where the MD says they are. You can expect the 250 to chirp at objects at least 8″ in the ground and I’ve pulled things much deeper. I can vouch for the machine and have told all my friends about what a great tool it is. If you are in the market for a new detector – don’t think of the ACE250 as an introductory machine as it is much more. I traded in the Ace 150 my wife gave me for Christmas towards an Ace 250. The second time I used it was at the Gateway Treasure Hunter Clubs spring hunt, and found a prize token ( the prize was an Ace 250 ), so now I have two 250’s. Anyway, when searching at an ocean beach, lower the sensitivity, when hunting at a large club treasure hunt, lower the sensitivity, get the coil boot and keep the coil on the ground for better results. It might be me, but, pull tabs, beverage cans, foil, and sun lotion sample pouches all appear as nickles ( it’s amazing, how much trash happy beach goers leave behind ). When hunting with others who have more sophisticated machines you must turn down your sensitivity, and avoid getting too close to them, as the 250 goes nuts. Other than that we’ve had a lot of fun with these machines. The ACE250 in my opinion is THE BEST intro detector of any on the market today. It is also the best all around detector for the beginner and pro alike. Easy to read and understand display. Distinct Tones in all modes. Easy setting ( push button) modes and custom mode. Easy to learn ( Usually within 10 hours of use in the field). Great for kids and adults alike. The ACE250 is an all around fantastic machine especially when matched with a Sniper Coil and a Leche Digger.PERFECT combination. HIGH TECH MACHINE and a very reasonable price. On the down side would be pinpointing with the standard coil…Could use improvement. When hunting with the Sniper Coil, pinpointing is NO PROBLEM..Right on the money ! THANK YOU MR. GARRETT for a detector of QUALITY/USEABILITY/HIGH TECH and a reasonable price for anyone wanting to enter the metal detecting hobby. Does as well as any of the other more expensive machines that I own. Plus it doesn’t wear your arm out after a few hours of swinging it. 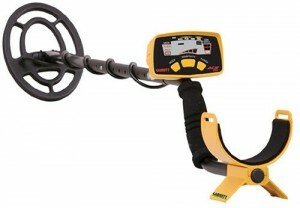 What Type of Metal Detector Should You Purchase?